Inhabitat is one of my favorite Internet sites. They’ve just featured Burning Man – specifically, the Hayam Sun Temple designed by British architecture student Josh Haywood. This might give David Best’s Temple of Grace a run for it’s money this year. London-based designer and University of Westminster architecture student Josh Haywood has designed the Hayam Sun Temple, a stunning temporary pavilion built from lasercut plywood for Burning Man 2014. The annual festival, which attracts some of the most creative and diverse minds from around the world to Nevada’s Black Rock Desert, awarded the Moorish-inspired filigree design with the Burning Man Art Grant. Haywood and his fellow architecture and design classmates have also taken to Kickstarter to crowd fund the project’s construction and transportation costs. As a temple to the sun, the pavilion forgoes the trim of precious metals and enamels characteristic of Moorish design and relies instead on the sunrays that will filter through the delicate screen and bathe the temple in a golden halo. Inspired by tessellated Moorish architecture, the temporary art installation is pierced through with intricate geometric cutouts that filter the sun’s rays and cast dramatic shadows onto the desert floor. At night, the Hayam will be illuminated from within like a giant lantern. 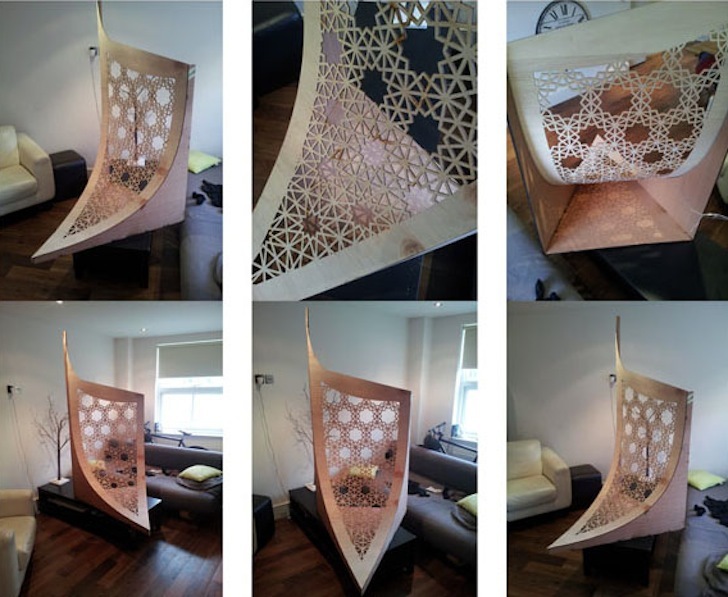 Built with plywood laser cut into the intricate patterns of Islamic geometry, each perforated piece will be seamlessly joined together into a curvilinear structure that rests atop four pillars. We are a group of designers and architecture students from London. Our aim is to produce joyful and spiritual architecture using digital design and fabrication. In this time of world conflict we believe nothing is more important than the bringing together of people as exemplified by the Burning Man community. The Hayam Sun Temple is our contribution to this quest for peace and harmony. The word ‘Hayam’ is one of many Arabic words for love, specifically passionate love, and this is a project that has been built on passion and love. I believe that all the important things in life should be carried out with passion, whether that be loving, designing, making, or building. This tessellated temple is the result of a year-long study, exploring the mystique and magic of Moorish architecture and researching the refined geometry and pattern of the Alhambra and the Alcazars. Geometry is the language of the universe and speaks to us all equally. I have experimented with the digitalisation of these geometries in parametric models to generate new and exciting architectural forms. The Hayam is a temple to sunlight, open to the sky, filtering the sun’s rays through the intricately pierced plywood panels, and throwing dazzling patterns of light in every direction. At night the four pillars are illuminated from within like a giant lantern. The pavilion references motifs and arabesques traditionally found in Moorish architecture but in itself the Hayam has ties to no religion; it provides a shared spiritual and sensual experience that transcends language and culture. The theme of the festival this year is ‘Caravanserai’, and our pavilion shares in all the connotations of that word: travel to exotic parts, adventure and exploration, fusion of cultures, crossing of borders, rest and shelter for weary travellers before they continue on their journey.